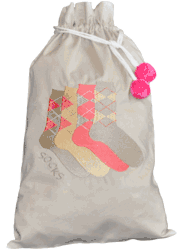 Such a cute argyle sock bag -- the perfect way to store socks in a fashionable way, and to pack them along for all of your adventures. Cute gift idea too! Measures 16" x 10.5"